The Xtreme Off-Road Brite Lites post mount spot and flood lamps are available for any 12 volt application. We offer a full line of post mount lights from mini 2" LED spots up to a 7" round HID Rally light that shines almost a mile! Work light Flood beams and Pencil Spots for any need. A flood beam will give a wide field of vision and is great for slower moving vehicles. A pencil spot is a focused narrow beam for faster moving vehicles and you need to see as far forward as possible. Xtreme Off-Road Brite Lites LED light in the Post Mount LED design. Super tough all Aluminum housing acts as full heat sink and provides great protection for long life. Designed for use on motorcycles and ATVs as driving/fog lights. Great supplemental light on anything. Rated to last 30,000 hours. 2" round model has 1 LED, Spot beam, uses 10 watts- .9 amps, and puts out 900 lumens. 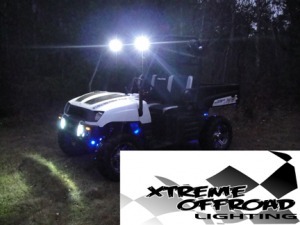 Xtreme Off-Road Brite Lites LED light in the Post Mount LED design. Super tough all Aluminium housing acts as full heat sink and provides great protection for long life. The nice thing about this light is it is very thin. Super easy to mount against almost any surface. Good for back facing light on truck, tractor, or low amperage ATV/UTV. Rated to last 30,000 hours. 4" Round model has 9 LEDs, FLOOD pattern, uses 24 watts- 2 amps, and puts out 1700 lumens. Xtreme Off-Road Brite Lites LED light in the Post Mount LED design. Super tough all Aluminium housing acts as full heat sink and provides great protection for long life. Great on the nose of a vehicle, in the bumper, or on winch rack. Rated to last 30,000 hours. 4" square model has 4 LED, uses 16 watts- SPOT beam, 1.3 amp, and puts out 1900 lumens. Xtreme Off-Road Brite Lites LED light in the Post Mount LED design. Super tough all Aluminium housing acts as full heat sink and provides great protection for long life. Rated to last 30,000 hours. 4" square Flood model has 6 LED, uses 18 watts- 1.4 amp, and puts out 1900 lumens. Xtreme Off-Road Brite Lites LED light in the Post Mount LED design. Super tough all Aluminium housing acts as full heat sink and provides great protection for long life. Rated to last 30,000 hours. Best long range post mount light possible. Narrow pencil beam. 5" Round Spot model has 14 LEDs, uses 42 watts- 3 amps, and puts out 2550 lumens. Xtreme Off-Road Brite Lites LED light in the Post Mount LED design. Super tough all Aluminium housing acts as full heat sink and provides great protection for long life. Rated to last 30,000 hours. 5" Round Flood model has 14 LEDs, uses 42 watts- 3 amps, and puts out 2550 lumens. Xtreme Off-Road Brite Lites LED light in the Post Mount LED design. Super tough all Aluminium housing acts as full heat sink and provides great protection for long life. Provides super wide trap light, excellent on industrial/Ag equipment, anywhere you want a super wide working beam. Rated to last 30,000 hours. 4"x5" Rectangle Flood model has 5 CREE LEDs, uses 50 watts- 4 amps, and puts out 4200 lumens. Our Best Seller by far for Post Mount LEDs! 6 Hi-power LEDs in an cast aluminium housing. 6.25" long, the flood beam light use 18 watts, 1.3 amps and put out 1300 lumens of light. The stand alone fog light can be used as a primary headlight or as a supplemental light. Great for headlights on a golf cart, reverse lights, trailer back up lights, interior lights, spot lights, or any other directional light need. Packaged with stainless mounting hardware.